The dust of Fall is settling all around, although the temperatures do not seem to reflect it. It is a time for pause and reflection on the year, and where I have gone with my work. I look back, and I see paintings that mark the days and events of the past year. I spend almost every day here and the better part of it alone, and I have a visual reference of work to let me know the progression of time as well as the direction of my art. I have watched my work transform and translate over the days and months. I am finding the older I become; the more I am drawn to the more simple subject matter: the more simple the subject for me, the more complex the paint: the more complex the paint translates into a longer thought process and relationship with the paint; the longer thought process the deeper the connection between the painting and myself. 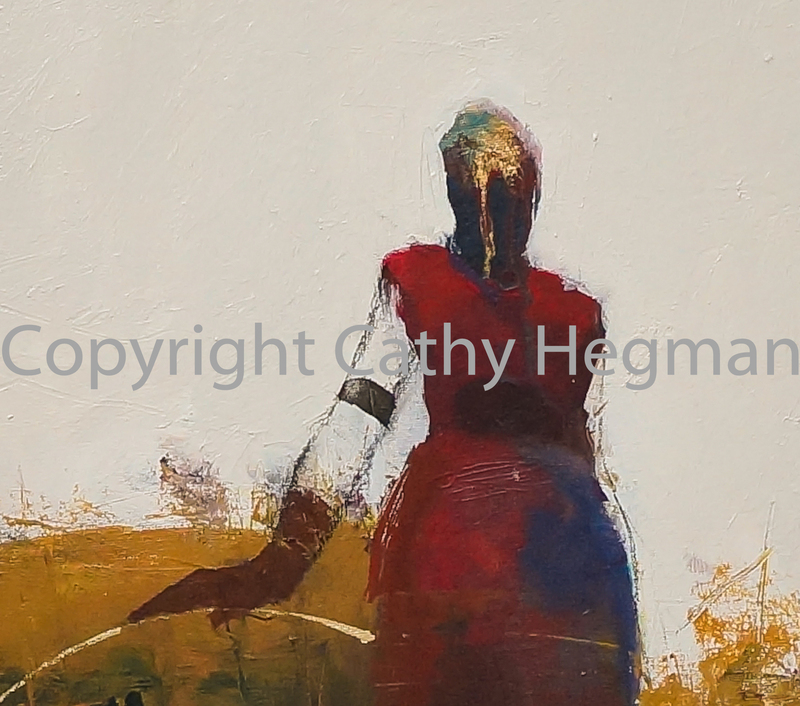 As figures are my muse, and have been for some time, I have and will continue to seek a way to paint a figure that is as much a part of the surroundings as the surroundings are a part of the figure. I want a balance to exist between the environment and the figure that will evoke the interdependence of one to the other and the coalescence of the two. 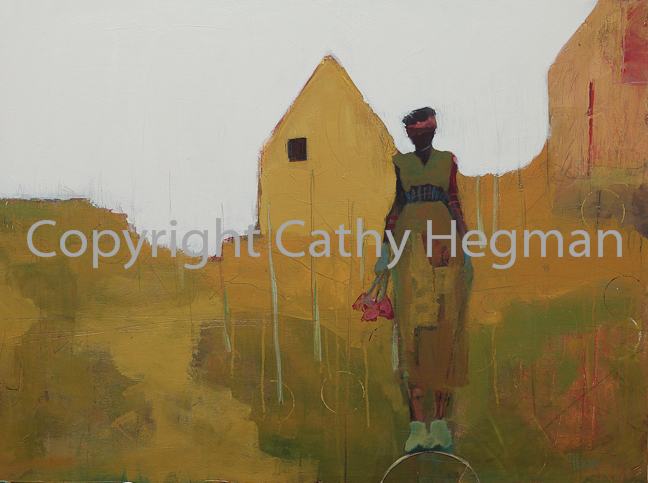 Weight of Balance Domestic Life, is a painting that has truly morphed and changed, every time I have addressed it in the studio. The beginning stages had color and lines that were almost too precise, and too beautiful,not the emotion I was attempting to portray. I left this painting several times with the intent for varnish the next day, only to return in the morning with the knowledge that there was more to say than just the prettiness of the paint. At this stage the painting seemed complete, but when I got home from Colony, it seemed to be lacking, what was missing? 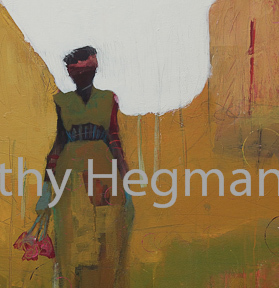 I think for me, it was an adequate painting, but I wanted this painting to be about much more than nice color and shapes, I needed to feel like I related to the figure and the environment, and somehow I no longer felt the connection. The figure appeared to belong in this place but as a whole the painting was so benign. As I moved supplies back into the studio,I put the painting on the floor where I had to face it each time I walked into the room. Finally after a couple of days of dancing around the issue of going back into this painting, I decided to begin work on it again. I really thought about it, and for me the issue was one of aesthetics, I found this painting too safe, the edges were too alike, the figure had nothing that I had not seen before, in my figures and it emoted no particular feeling to me. It was in a nutshell lifeless, adequately lifeless. Not good enough, I wanted more, so with big brushes in hand, I began to really work on this painting. I had to destroy much of the harmonious color palette in order to achieve a deeper meaning for the painting. I realize for some this may seem really silly, the notion that I would want a painting to do more than decorate a wall, but for me art is so much more than decoration. I really feel that we leave a part of ourselves in the paintings, and although beautiful is all well and good; at this point my life is not really about how things look as much as, it is how things exist and feel. So after now 4 weeks of working on this piece, I finally feel the glimmer of finish coming over the horizon. The surface is mature and has a rich textural quality that belies and is symbolic of life and how it truly feels. The paint has layers of color that obscure and reveal the underpinnings of the structure of the painting. The edges now have a variety that is rough and at times jagged much like domestic life The figure seems to have purpose and seems to belong in this place. I will still tweak the layers, and add some marks, and make a few more adjustments, but the backbone of emotion is here. The figure is evocative, it is stable, and it exists where and how it should in the picture plane of it’s surroundings. I feel a form of validation for persevering and bringing this painting out of normalcy and into something more. It, as well as I, have turned a corner in art, I believe I have learned to be honest with myself when dealing with my art and to not settle for less than I had anticipated. I hope this will give you the inspiration and courage to be brave and push the boundaries in your art, even if you have to destroy a painting in order to create a more meaningful painting. Thank you for reading my blog, I am always grateful. This entry was posted in acrylic, Art right outside my back door. The Big Sunflower River, canvas, cathyhegman, drawing, female, figure, fine art, painting, Uncategorized and tagged animals, art, artist, beeswax, cathy hegman, cathyhegman, contemporary, drawing, encaustic, experimental, female, figurative, figurative art, figure, figure painting, figures, fine art, fineart, flight, hegman, instruction, landscape, mississippi art colony, mixed media, painting, paper, woman, wonderland. Bookmark the permalink. 7 Responses to The morphication process…. Gosh darnit, Cathy. You do it to me every time, even to the point of tears. You help me so much to be true to myself,again. You have said that so many times and I need to post it here in my studio so that I do not, once again, get caught in the “will someone like this on their wall” trap!! PAINT FOR ME!! Patty! Thank you so much for the comment, you give me the extra push to keep blogging… I really started the blog to be able to put down emotions and ideas about my art making process that otherwise might never be realized by a viewer. I think I later realized the blog is a wonderful chance to communicate with other artists about the life of artists, the practice of art, the good the bad and the ugly of creating a painting, it is not all butterflies and sunshine on most days…it proves that I exist on some level outside of my studio and that my struggles and triumphs are paralleled by others…Thank you for reading it!!! I look forward to seeing you again when you come back to this side of the river…. 🙂 Take care my friend! Great post–the mark of a mature artist is that willingness to push past what is OK, fine, adequate into true exploration of the medium and its expressive potential. You describe this so well!! Thank you Rebecca!! I needed that! I often feel my heart is saying things that my words fail to translate! Very soul-full blog AND painting, Cat. It allows me to realize that this long hiatus from painting that I’m experiencing (2 years!) is a maturing process that had to be done outside the studio, in my case. I don’t pretend to understand why, but I can say that during these years, I’ve turned several corners and come upon a Self which is wounded but vital, a soaring Spirit, and a Soul which balances it all on some imperfect fulcrum, but it IS a fulcrum. I know the poet in you will understand on some level what I’m saying here, we are so similar in many private and internal ways. So grateful for your friendship!